Yet the public outcry which typifies the hostility to all ASM gold mining - legal and illegal leaves little room for a discussion of a holistic approach to tackling the complexity of the creature that is artisanal and small- scale mining. A complexity which policy makers have spoken of, but which seems to be getting very little by way of concrete action. It can be argued that alongside addressing the problems brought about by illegal gold mining, it is important that Ghana explores how to better organize and regulate artisanal and small-scale mining such that it can contribute to job creation, improved livelihoods for small scale miners, economic diversification and even more importantly, can support inclusive development. The campaign against illegal gold mining is taking place alongside a long running conflict between ASM salt mining and Seven Seas Industries being waged in the Keta Lagoon in South East Ghana. Seven Seas, a foreign owned company has been given a concession to mine salt in and around the Keta Lagoon, a concession which has had the effect of cutting out the ASM salt miners in the locality. Unlike gold however, there has been little attention paid to the issues confronting the communities impacted by Seven Sea's activities. Even after confrontations which have resulted in injuries and death to community members. Gold is one of the country's three main commodity exports and accounts for over 95 percent of total mineral revenues. In 2012, gold exports from Ghana were reportedly worth US$5.64 billion. Yet despite the importance of gold to the economy, links between the gold sector and the rest of Ghana's economy remains relatively weak. It is a sector largely dominated by large scale foreign mining companies who account for approximately 65 percent of gold production and provide employment for approximately 16,000 people. Large scale mining also indirectly supports over 60,000 jobs. Artisanal and small-scale mining on the other hand has a far deeper reach into communities and on livelihoods. According to Ghana's Minerals Commission, small scale gold mining has increasingly been contributing to gold production. In 2016, it contributed 31 percent of total gold production and according to the Commission had the potential to contribute to poverty reduction as well as stimulated economic growth in areas where it was taking place. ASM directly employs over 1million people and creates employment opportunities for over 5 million more in downstream industries and markets. Small scale gold mining in Ghana was given legal backing in 1989 through the Small-Scale Gold Mining Law (PNDC Law 218) which set out the conditions under which small scale mining in gold could be undertaken. According to the law “no licence for small-scale gold mining operation shall be granted to …any person who is not a citizen of Ghana”. Thus, the law restricted small scale gold mining (SSM) to Ghanaian citizens and set out the steps by which those wishing to undertake SSM needed to take. In the years since the law was passed artisanal and small-scale mining (ASM) has grown and today is an important economic and livelihood activity. The growth in ASM can in large part be attributed to the rise in the price of gold and has been facilitated using technology and equipment which hitherto were not available to ASM. As the gold price rose, the gains from mining gold made ASM attractive, as what could be considered as lucrative gains could be made for people with minimal input. Again, the growing numbers of unemployed youth also saw the sector as attractive due to the low barriers for entrance. However, despite the legal provisions for small scale mining, majority involved have failed to obtain licenses to mine and illegal gold mining activities (galamsey) have grown. It has involved not only Ghanaians, but also foreigners who have been actively participating, both in terms of offering financial and other resources to facilitate mining, but have also been directly mining for gold. The Chinese have been the visible face of foreigners in illegal mining activities in Ghana, but foreigners from across Africa (particularly West Africa) and beyond have been doing galamsey. Illegal gold mining has been on the increase for several years and has been directly linked to very destructive impacts on agricultural lands and the environment, particularly rivers and other water bodies. Major rivers have been polluted and are unfit for use while gaping and very dangerous pits have been left over in farmlands and riversides. There have also been negative impacts on health as whole communities and people working in galamsey have been exposed to health and safety risks associated with dust inhalation, mercury poisoning and major injuries from a sector where safeguards are few and industrial accidents are prone. Meanwhile, in the midst of the campaign, in July, some 22 artisanal miners were feared buried alive when a pit they were mining in collapsed on them at Nsuta near Prestea in the Western Region of Ghana. After 6 days of rescue efforts failed, the rescuers gave up and the pit was closed. Galamsey, despite all the efforts at proscribing it is very much alive. To the state, the cost of galamsey both in economic and environmental terms is massive. The unauthorized (illegal) appropriation of gold means that all the revenue gained from galamsey is not taxed. On top of that the cost of reclaiming land and water bodies destroyed from galamsey activities has been estimated to run into the hundreds of millions of dollars. The environmental costs of and spread of galamsey activities has resulted in a public outcry as images of the destroyed lands and polluted water bodies brought to the forefront the extent of the problem at hand. Warnings from the Ghana Water Company that if left unchecked, galamsey activities would lead to an acute water crisis, with the country having to import potable water, have stoked up the calls for something to be done immediately to deal with the issue. In March this year, the Minister of Lands and Natural Resources issued a three-week ultimatum to galamsey operatives to cease their activities or face the full rigors of the law. Truth be told this was not the first time the Minister of Lands and Natural Resources or the government has taken a stance against illegal mining. In 2013, President John Mahama's government constituted a task force whose members included the Ministers of Interior and Defense, as well as Lands and Natural Resources, which oversaw action taken against galamsey. The task force at the time directed the impounding of equipment and the arrest of illegal miners, many of whom were foreigners. Further back during the presidency of John Agyekum Kufuor in 2006, the armed forces were galvanized against illegal mining in response to the complaints from the large-scale mining companies that illegal miners were encroaching on their concessions. The difference this time round is the media involvement and lead of the campaign. Both state sponsored and private media came together and in April with big fanfare, launched the Media Coalition's campaign against illegal mining. In the days leading up to the launch the media went on an all-out blitz to inform people on the launch with floats and signs and other paraphernalia. Not only was the Minister for Lands and Natural Resources in attendance, also there were the Ministers for Water Resources and Sanitation; Environment, Science, Technology and Innovation and the Minister for Information. Government agencies such and the National Council on Civic Education (NCCE) have also joined the coalition and are supporting the campaign. In addition to the support from government, a wide range of groups have joined the coalition. These include religious bodies such as the Christian Council of Ghana and, the Ghana Pentecostal and Charismatic Council; political parties such as the Progressive Peoples Party; advocacy groups such as Occupy Ghana and even industry players such as the Ghana Chamber of Mines. The judiciary have not been left out, and have been swept up by the campaign as well. In April, the Chief Justice designated 14 courts - 7 High Courts and 7 Circuit Courts to deal with issues of illegal gold mining. The designation of the courts to deals with this was “in furtherance of “the recent groundswell of public revulsion and media and civil society advocacy against the menace of illegal mining. Neither have the armed forces been left out. President Akufo Addo noted earlier this year that “Ghanaians would continue to rely on the efforts of our security forces, with the Army in the forefront to help deal with the problem “. It must be pointed out that not all trust the army though, as some allege they are rather protecting and facilitating illegal gold mining. In the meantime, the Minister and his deputies have been visiting gold mining communities and sites to spread his message and in some cases, has caused the arrest of illegal gold miners and confiscation of equipment. Not everyone has warmed up to his message or to the campaign though, there is resistance to it. A few communities have railed against the campaign and the actions taken to stop illegal gold mining, arguing that it was an attack on their livelihoods and unless viable alternatives were presented to them, they would take matters into their own hands. Some have threatened to hit the Governing New Patriotic Party where it hurts them most, not voting for them during the next elections. While all agree that the challenges brought about by illegal artisanal and small- scale mining must be addressed, the question of how seems to be on the back burner. In March, a Multilateral Mining Integrated Project (MMIP) was proposed as part of government's efforts to tackle the galamsey problem. The project was expected to put forward a “broad understanding of the reality and challenges faced by authority responsible and all other related MDAs to ensure evenhanded and equitable over- sight of mineral resources. The project is to reduce illegal small-scale gold minig to the barest minimum and find alternative livelihoods for those involved”. The MMIP is expected to be a multifaceted project that not only helps stop illegal gold mining but also promotes responsible, legal gold mining practices. Since the launch of the project however, little seems to have taken place with regards to actualizing the initiative. Ghana's President Akufo Addo spoke to the need to approach the issue in a manner that looked at the wellbeing of small scale miners. In his May Day address to workers, he stated that the government was not seeking to put people out of work through its efforts to end galamsey, but that it was looking to ensure that mining be conducted in a sustainable manner. According to him “this present generation does not own the earth, we hold the lands in trust for generations yet unborn and we cannot destroy it. We are arranging for small-scale mining to be conducted in a sustainable manner”. While campaigns such as the ongoing media campaign against illegal gold mining may, in the short term, focus the attention of the public on the ills of the practice and help policy makers by drawing attention to issues such as the pollution of water and destruction of lands, it is unlikely to succeed in putting a stop to illegal artisanal and small-scale gold mining. Policy makers must necessarily take a long-term approach to addressing the situation., in the words of President Akufo Addo” Since the Almighty blessed us with precious minerals, there will be mining in our country.” How it will be done in a way that also brings benefits to Ghana and its citizens needs to be clearly thought out. By Pauline Vande Pallen. Pauline Vande Pallen is programme officer, Third World Network-Africa. Source: Africa Agenda, Vol. 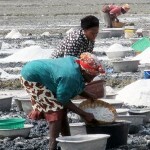 20.2, “Africa’s Small Scale Miners: no place at the table".